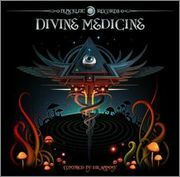 DR. SAMMY "DIVINE MEDICINE" V.A, Blacklite Records,OUT NOW! Blacklite Records is proud to present 10 exclusive tracks carefully produced from some of the psychedelic masters around the globe. Welcome to our music prescription “” Devine Medicine” music that will teleport you to ecstatic trance states in order to connect you with the spiritual dimension of reality. Practiced since ancient times in many tribal cultures around the planet, music is a ritual of spiritual communication and healing. Psychedelic trance continues to offer today what it has been offered for thousands of years: namely, a simple and effective technique of ecstasy. Our shaman on decks Dr Sammy, will pave his way from 142bpm to 145bpm and will melt ingredients to gradually intensify your trance to psychedelic states of conciousness. Music Listeners may progress until they reach the level that is necessary for healing to occur. When ready to exit the trance state simply slow the volume and draw consciousness back to normal. Our Devine medicine crafted to function as a vehicle for healing, consciousness expansion and awakening is now available for you! Dr Sammy was born and raised in the north suburbs of Athens, where he discovered psychedelic trance parties in the mid 90s. He perceived later his passion in the dj culture, twisting knobs on his older brothers mixing desk, picking up his tunes and playing a lot of different kind of music. Inspired from the early outdoor gatherings and european open-air festivals, Dr Sammy decided to follow the way of the psytrance scene and to push his DJ project, aiming to emerge as a very flexible Dj and ready to rock any dancefloor at any time 2012 has been for this guy a very active and busy year! Dr Sammy confirmed his position as a Residence Dj in "Amorphia Parties" and he played in all Greek Summer Festivals. He finally joined "Akida Artist and Dj Management" as well as "Blacklite Records", as a result for his constant work and persisting passion for the psytrance music and culture.